...... but your client sends to you some spreadsheet? Having data entered in format your software does not understand is... frustrating experience... especially when you need that report right now. 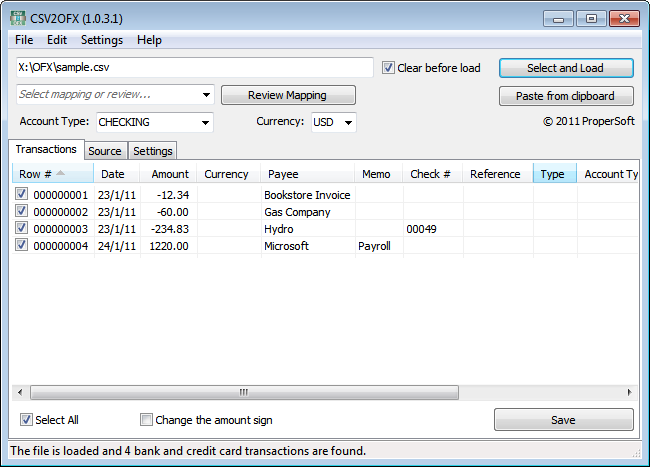 CSV2OFX is exactly what you need to convert your CSV file to OFX that your software (MS Money, Simply Accounting or others) understands. Qweas is providing links to CSV2OFX 2.0.1 as a courtesy, and makes no representations regarding CSV2OFX or any other applications or any information related thereto. Any questions, complaints or claims regarding this application CSV2OFX 2.0.1 must be directed to the appropriate software vendor. You may click the publisher link of CSV2OFX on the top of this page to get more details about the vendor.